Pan Mixer South Africa and Reef Construction Machinery was established by its founder H. H. Ebeling in 1976, in Sebenza, east of Johannesburg. In 1982, following years of rapid growth and expansion, the factory was relocated to Jet Park in Boksburg. On these premises our unparalled drive to service excellence, expertise and experience paved the way for continued growth making PMSA the largest manufacturer of concrete brick and paving machinery, turbine pan mixers, counter-current rapid pan mixers and counter-current planetary pan mixers, and batching plants for the concrete, refractory, foundry and ceramic industries in Africa. In 1995 the next generation, Walter and Robert Ebeling took over at the helm of the organisation, providing a strong foundation of business and engineering expertise. Today the staff compliment exceeds 120 people consisting of commissioning and servicing teams, metal workers, engineers, C. N. C. operators, programmers and CAD design staff. Complete projects are undertaken, from design to final erection and commissioning, encompassing mechanical, pneumatic, hydraulics and control systems, including programmable controllers. These projects can be undertaken on a full turnkey basis if required. PMSA is the sub-Saharan distributor for several international companies such as Eurostar (counter-current planetary pan mixers), Franz Ludwig (moisture measuring systems), SERMAC (concrete pumps), LeycoChem Leyde (chemicals for concrete applications), Finke GmbH (pigment dosing systems), BFS Casagrande (concrete pipes, manholes, culverts and wet cast manufacturing), Rettenmeier (wooden production boards for large machines), Wil El Mil (concrete kerbstone presses) and Fiori (self-loading concrete mixers). he government’s launch of 101 ‘catalytic projects’ in terms of its Breaking New Ground housing policy is good news for the concrete products sector. Reef Construction Machinery of Cape Town, part of the PMSA Group, manufactures Rocksolid moulds for the concrete brick- and block-making industry, as well as providing a service to the industrial energy sector. By establishing associations with leading technology providers in Europe, PMSA is ideally placed to be able to offer the most advanced solutions for the manufacture of concrete products. This goes hand-in-hand with PMSA’s own home-grown technology. PMSA, the leading manufacturer of brick, block and paving machines on the continent, has pioneered a new range of Ultravibe vibrators that set a new industry benchmark for productivity and efficiency. PMSA, the leading manufacturer of brick, block and paving machines on the continent, celebrated its 40th anniversary at Totally Concrete 2016 in May with the launch of its new Ultravibe vibrating system. The leading manufacturer of brick, block and paving machines on the continent, PMSA celebrates its 40th anniversary this year. The OEM continues to focus on technological development, such as the introduction of its new Ultravibe vibrating system. : New mega housing projects announced by the government stand to boost the concrete products manufacturing industry, which has seen many cement suppliers drop their prices due to decreased demand and excess cement supply. Shukuma Bricks has consolidated its position as the leading brick, block and paver manufacturer in the Eastern Cape by investing in a new Kraft Nautilus air circulation system supplied by PMSA. Extra heavy-duty, distortion-free frame ensures dimensionally accurate products. We supply a wide range of Block Making Machines. 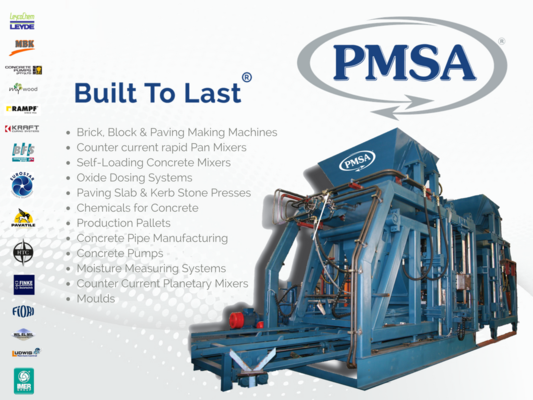 The PMSA Hydraulic Uni block making machine manufactures up to 17000 standard bricks per 9-hour production shift as well as high quality paving and hollow blocks. We have a wide range of brick making machines. RE 600 Block Making Machine fully automatic with PLC control, variable vibration frequency and hydraulically operated overhead concrete silo door over time.